Win a car, motorcycle, boat, RV, or all kinds of other vehicles by entering these fun sweepstakes! Car sweepstakes have some of the most popular prizes to win. After all, who wouldn't love to win a car for free? 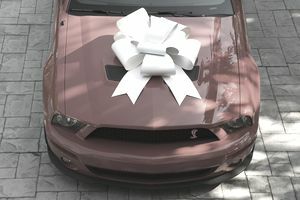 Here are some of the best free car sweepstakes available, gathered in one place to help you win. You'll also find chances to win boats, motorcycles, bicycles, and other vehicles and accessories. When you enter car sweepstakes, you also want to keep the tax burden in mind. US residents must treat all sweepstakes prizes as income. In other words, if you live in the US, you will be taxed on the value of the prize as if you had earned that amount through your job. However, that's not a reason to avoid car sweepstakes. See How to Afford Taxes on Car Sweepstakes Prizes for ideas on how to reduce the tax burden if you win. One lucky winner will receive $5,000 worth of parts and accessories to upgrade their vehicle. Found an Error on the Car Sweepstakes Page? If you've found an error on the car sweepstakes page, like a link that's not working, a typo, or an error, email me and let me know! Note that I can help you if there is an error on this page, or if one of the links doesn't bring you to the correct page.